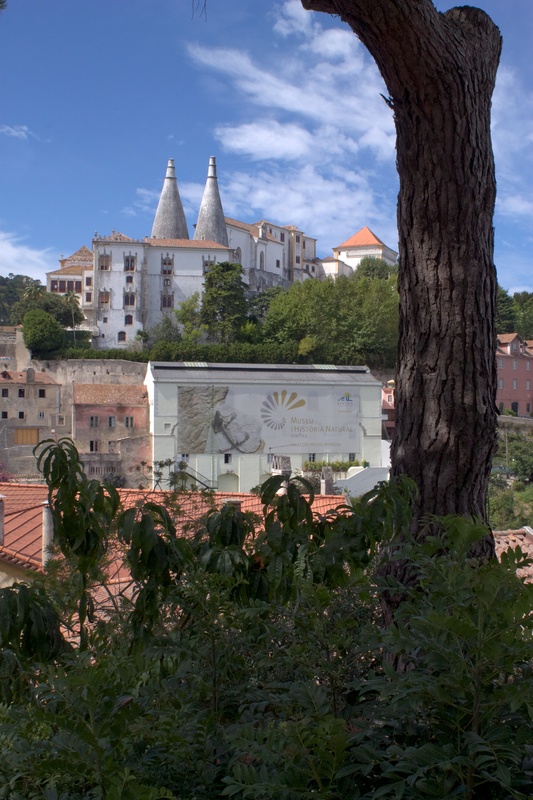 Back in August, we published a post on planning a possible day trip to Sintra, Portugal. Sintra is a short 35 minute train ride from Lisbon’s central Rossio station an offers sightseeing opportunities at a variety of castles within a short distance from the town center. After comparing the attractions in Sintra to alternative activities in Lisbon, we decided to make the day trip. In fact, we were so excited about Sintra that we went there the day of our arrival from the United States, despite our jet lag. Our visit did not disappoint, although we left feeling we only scratched the surface of the city’s sightseeing opportunities. Our fatigue led to a rather rushed tour of the Pena Palace (described below) and a longer than expected lunch pushed the caves at Quinta de Regaleria and the gardens at Monserratte out of our schedule. We still thought the journey was well worth the effort. Sintra offers very unique landscapes and an appreciation for Portuguese royals that is very distinct from experiences in Lisbon. The train station in Sintra is about a ten-minute walk from the town center. The walk provides some excellent views of the National Palace (as seen in the picture above). We did a very thorough tour of the palace, using the provided audio guides. Highlights included the Stag Room with it’s dramatically-adorned ceiling and Atlantic views, and an ivory pagoda on display in the Chinese Room. Unfortunately, we needed to work a little bit to avoid a huge tour group by backtracking. We were unable to avoid large crowds in the kitchens directly underneath the palace chimneys. After lunch on the town square, we caught bus #434 up to the Pena Palace. The bus can be caught in front of the tourist information office to the southwest of the National Palace, and a €4.60 ticket allows you to take the bus back to town or the train station. The fare is a bit steep, but the hike up to Pena Palace is much steeper–definitely don’t plan on walking. After getting off at the ticket office for Pena Palace (about 15 minutes from Sintra), you have the choice between hiking another hill on your own or taking a green trolley for €2. We opted to hike, which took approximately 10 minutes. The Pena Palace is a flamboyant example of the opulence of Portuguese royalty, even well after their most effluent years. The castle is built in a Romantic style, very similar to King Ludwig’s Neuschwanstein Castle in Bavaria. We weren’t thrilled by the audio guide, which was long-winded and skimpy on interesting historical facts. Although the building is certainly striking, I think we most appreciated the picturesque views from the hilltop. Make sure and turn right and follow the pathway along the edge of the building to access a terrace offering views of the Atlantic Ocean and the Moorish Castle as captured in the picture below. Just downhill from the Pena Palace ticket office is the entrance to the Moorish Castle. Just past the entrance, you see ruins of the old castle. Make sure you continue down the path until you get access to the walls themselves. The real thrill is climbing the stairs along the walls. 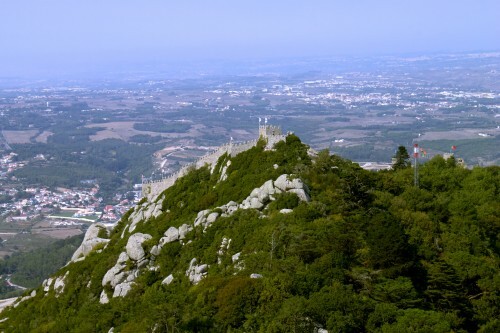 A short hike to the East offers amazing views of the Pena Palace. During our visit, we saw a lot of activity in restoring different sections of the castle. It’s amazing it is preserved as well as it is. After connecting back to the Sintra train station on bus #434, we travelled back to Lisbon in time for a quick nap before dinner. We were certainly pleased with our trip to Sintra, and plan on returning during future trips to Portugal. Not only did we obtain some appreciation for Portuguese royal history, but we also returned with many spectacular photographs of very unique buildings and beautiful landscapes. This entry was posted in Travel and tagged Lisbon, Portugal, Portugal/Spain 2012 Trip by Ryan. Bookmark the permalink.